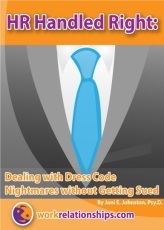 « Business Casual and the Psychology of Office Attire or Who Cares What you Wear to Work as Long as you Perform? You’ve worked with them. The employee who plagues you with chronic personal problems. The manager who constantly expects you to wave your magic wand and make all his “people” problems disappear. The worker who suddenly starts coming in late, making mistakes, and missing deadlines. In short, the twenty percent of your employees who take up 80 percent of your time. Among the many hats human resource professionals are asked to wear, unofficial company “shrink” is often one of them. This is both a blessing and a curse. On the one hand, human resource professionals who are empathic and available are much more likely to earn the trust of their managers and employees – and to save their company millions of dollars by resolving interpersonal complaints that could easily wind up in a courtroom. On the other hand, it can be tough to know how to draw the line between being empathic and enabling, not to mention carving out enough time and emotional energy to get your other tasks done. Believe me, I know how hard it is to set boundaries. Before I found a way to gracefully handle impromptu consulting requests, I listened to messy divorce stories on airplanes, consulted about performance problems in the ladies room, and once spent my time at a cocktail party role-playing with a guest who wanted to confront an offensive coworker. It took me a while to realize that I wasn’t doing myself or anyone else a favor being “on call” 24 hours a day. In this article, we’ll take a look at how human resource professionals can deal effectively with chronically troubled, and troublesome, employees — before they need a shrink themselves. It’s human nature to look to authority figures to bail us out when we’re in trouble; after all, our parents did it for years. However, while any of us can be sucked into rescuing a troubled employee, there’s no doubt that some of us are more likely to be recruited than others. Situations that have parental overtones are particularly likely to tempt employees to forget their grownup manners and revert back to childhood. For example, female managers or human resource professionals are more likely to be pulled on by a troubled employee than male counterparts – even if you’ve done nothing to encourage it. True or not, like it or not, the nurturing attributes stereotypically attributed to women set us up for rescue duty when employees are going through tough times. The same is true when there’s a large age difference between manager and employee. Age may or not bring wisdom, but it certainly does create the expectations of wisdom from the young. Understanding these interpersonal dynamics doesn’t mean you can avoid them, but it does mean you can be prepared when they do. When an employee begins bending your ear on a regular basis, end your sympathetic listening with a solution-focused discussion and a specific action plan, including a deadline for implementation. And, tailor your response to the nature of the problem. So how do you deal with chronically problematic employees without seeming callous or getting overly involved? The first step is determining whether the problems are personal or professional. If a troublesome employee keeps plaguing you with personal problems, obviously there’s not a lot you can do to solve them. Listening sympathetically while an employee blows off steam can help the employee relieve tension in the short run; however, you don’t do either one of you a favor by continually offering a shoulder to cry on. In fact, you may be unwittingly teaching your employee how to manage his or her emotions without coming up with a solution. When dealing with personal problems, it’s also important not to lose sight of your role as company representative. There is a big difference between communicating the message that you care about an employee’s personal problems and that s/he deserves special treatment because of them. For example, there are certainly times when giving an employee time off of work or telling him or her to “take it easy” are appropriate. However, if an employee has an ongoing pattern of personal problems and is not under treatment for a diagnosed mental health problem, these messages can easily be misunderstood as “permission” to slack off of work. Instead, ask him or her how s/he plans to keep the stress at home from interfering with work and what resources s/he needs to effectively deal with the ongoing personal problems. If the problems are professional, it’s time to do some informal investigating. Again, put the impetus back on the employee by asking him or her identify the employee what training and/or help s/he needs to more effectively manage their job responsibilities. Sometimes, it’s also necessary to step back and take a more holistic look at what’s going on. If, for example, you’re hearing several complaints about a particular manager, it’s time to assess his or her skill level; if you’re getting complaints about several managers, perhaps it’s time to rethink your promotion criteria. Do your managers have the management skills training to coach and delegate? Have they been promoted because of their technical expertise but lack the interpersonal skills to lead? Are they giving the employees more than they can handle? Put the clues together to see how you can proactively prevent small glitches from becoming chronic problems. Resist. No matter how tempting, resist the temptation to immediately give advice when employees come to you with their problems. Ask what ideas they have about solving the presenting problems, what they’ve tried, and what resources they need. If you’re called in to mediate an employee conflict, ask them to come up with a few solutions prior to the meeting. If appropriate, ask the manager to sit in as well so s/he can observe the outcome and provide appropriate follow-up. Resources. Be creative in developing interpersonal resources. Start a mentoring program whereby technical managers who have successfully made the transition from technical expert to great manager. Offer managers training on dealing with difficult employees, delegation and coaching; better yet, make it a part of a management development track. Encourage employees to take courses on conflict resolution, self-management and communication skills. Refer. Encourage chronically troubled employees to seek professional help. Your employee assistance program can be an invaluable tool in helping you, and your managers, deal with troublesome employees. Develop a relationship with your representative and find out what services they offer – brown bag lunches on stress management, individual therapy, and so forth. Many E.A.P. organizations offer complimentary training to managers on identifying, and referring, employees with mental health problems. Take advantage of it. The more interpersonally savvy your employees are and the more resources they have available, the less time you’ll spend dealing with people problems. And, the more you’ll get the reputation as the person who can steer employees in the right direction versus remove the obstacles in their path. Of course, we all know that there are times when the problem isn’t a matter of skill development or available resources. If these two fail, it could be that your employee is sending you a cry for help – perhaps s/he is in over his or her head. Let’s take the example of the manager who keeps solving his employees’ technical problems. If you’ve given him or her effective training on key management skills such as delegation and coaching, s/he has the skills to set appropriate boundaries with his or her employees. If s/he continues to spend his or her time solving employees’ technical problems rather than empowering the employee to figure it out him or herself, perhaps the problem is a lack of motivation to manage. There are more than a few technical managers who would much rather be back in the technical trenches than leading the team. However, either the lure of attractive stock options or the embarrassment of taking a step down makes them reluctant to say so. An honest conversation with an ineffective technical manager may be the beginning to help him or her decide whether his or her management position is really a step up or an added burden. If he or she wants to stay in management, work together with his or her superior to set some clear benchmarks for measuring his or her management performance. Include, if possible, a 360-degree evaluation that can provide objective feedback; it’s much harder to argue with an instrument than a person. Job satisfaction and employee retention are directly linked to the quality of an employee’s relationships. Empathetic and available human resource professionals are in a unique position to not only empower employees solve personal and professional problems, but, through their interpersonal skills, help their company save thousands of dollars that would otherwise be spent in employment-related legal fees. The trick in dealing with problem employees is not putting a bandage on their boo-boos when they cry, but rather help them learn how to heal on their own. Not only will this help them mature, it will leave you with the energy at the end of the day to deal with the children you want to take care of – the ones at home.